Here we go to one of the more controversial Pixar entries. A lot of people hate this movie. A lot more people hate the sequel but we’ll get to that later. I do not hate them. They aren’t masterpieces but they aren’t total trash either. Before I start the review I will give the same caveat I gave in my Planes: Fire and Rescue review- these movies are nutty. I recently talked about turning your brain off in a movie. Well, this is a movie where I kind of have to turn off my brain. Why? Well, let me give you an example of the kind of questions this world brings up. So we have a world of all cars, no humans. There are girl cars, boy cars, old cars, new cars. How do cars procreate? Are there baby cars that grow and morph into regular cars or do they emerge full size from some kind of car tree? Wouldn’t a world of all cars be really polluted and would they really care? They are cars. Their blood is basically gasoline- the grossest, dirtiest product out there. Also, who decides when they want to discontinue a car? Isn’t that kind of cruel? There is a Model T in the movie so obviously some cars are repaired and others are left to die with no new parts (in Planes: Fire and Rescue they have discontinued his gear box. I guess his number has been determined by someone to be up…very odd). You get the idea. If you start pulling at a string on this movie you will be down the rabbit hole in seconds. It’s bizarre. Who thinks of a world made entirely of cars? Well, John Lasseter loves cars and he directed this movie. And if you can see him through all the nuttiness there are some things to enjoy in Cars. 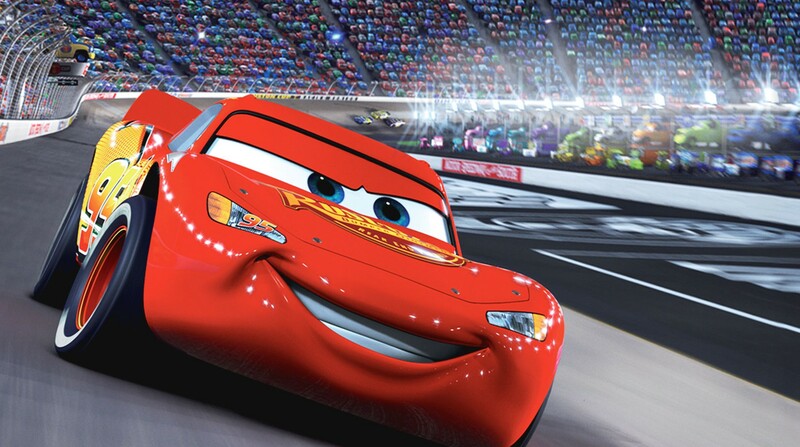 To begin with there is a young rookie car named Lightning McQueen who is cocky, brash and rude. 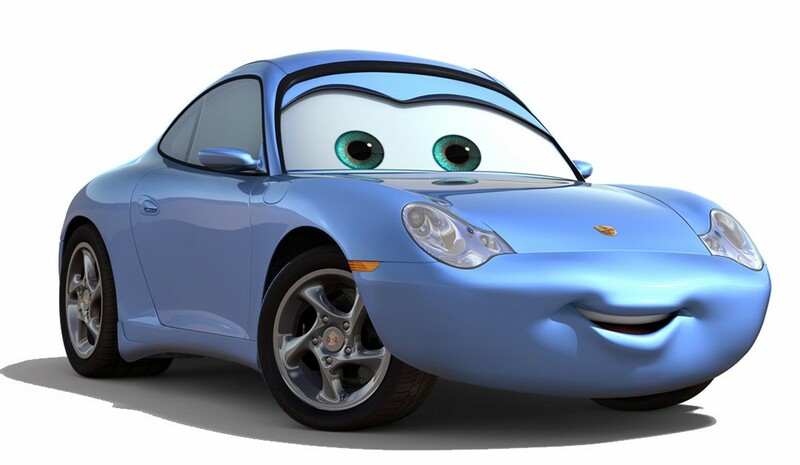 All the voicework is great in Cars including Owen Wilson as Lightning. The opening race scene for the piston cup is so much fun. It reminds me of going past the Indy 500 track every day on my mission. They capture the feel of the races and I think the way they added the eyes and mouths work for the characters. Compare them to the mouths and eyes for Thomas the Tank Engine and you will see what I mean. Lightning feels he is too good for his sponsor Rusteze who make bumper ointment which again in this nutty world is a funny joke. I also LOVE so much that my favorite radio guys from Car Talk Tom and Ray are featured as the Rusteze spokespcars. This is especially moving as Tom passed away last year and I miss hearing his voice every Saturday on my radio. I hate cars and I loved Car Talk. There are a ton of cameos in Cars including racing greats like Mario Andretti. As someone who lived near the Indy track that was a lot of fun. Lightning McQueen ends up getting lost on the way to California and ends up in historic Route 66. This is the strongest part of Cars- the love letter to Americana, Main Street USA and Route 66. It makes you want to get in a car and take a drive down an old highway and eat at an old diner. It’s a part of America that has been forgotten and that is the true message of Cars. To not forget the America that made us great. Anyway, he runs into a town called Radiator Springs and ends up damaging the road. In order to be released the Judge orders he fix the road which will take a few days. Meanwhile nobody at the track knows where he is or has a way to reach him. (We also learn earlier that Lightning has no real friends but an agent who could care less). So Lightning is forced to spend time with the yokels of Radiator Springs. Paul Newman is Doc Hudson- a crochety old Hudson car. George Carlin is a hippie VW camper van, and Tony Shalhoub from Monk (the man of every accent) is one of a set of Italians who dream of changing tires of a Ferrari. Cars has a huge cast so I could go on and on but the true co-star of the movie along with Lightning is Mater, the tow truck, voiced by Larry the Cable Guy. 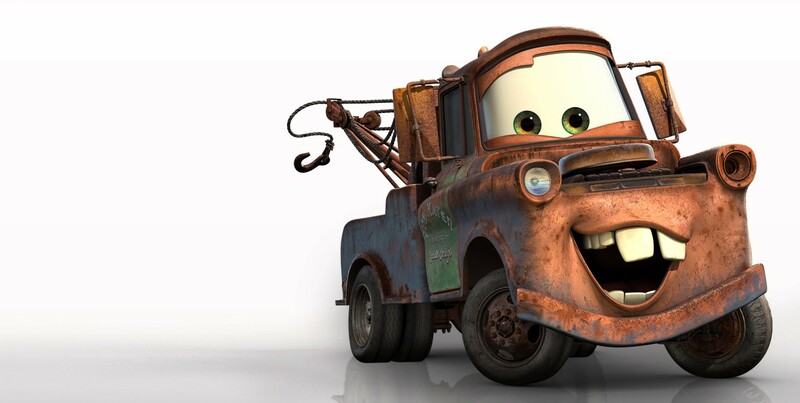 I know some people hate Larry and hate Mater but I think he is sweet, loveable and innocent. I really enjoy the character. He’s so eager to please others and make friends. That’s very loveable. He even says his signature ‘get r done’ that Larry used to do on tour. So I like Mater. And I really like the friendship Lightning and Mater form. It’s kind of a more simpleton version of Woody and Buzz. The plot to Cars is nothing we haven’t seen before. Of course Lightning grows to love the cars of Radiator Springs and of course he is humbled and becomes a better person. That is all fine. Where the movie is great is like I said in the homage and spirit of old time America and Route 66. I love this segment when Sally and Lightning are driving on their date. It’s so beautiful. I also love this scene where Sally tells Lightning about what happened to Radiator Springs. It’s the story of so many American towns and a great message for kids to learn about. They need to know about the death of Main Street America and how things used to be. Another special thing about Cars is how it uses music. This is one of the few Disney movies I can think of that uses a soundtrack (Lilo and Stitch?) instead of an original score/songs. I think this was because they wanted to pay homage to so many of the great songs about Route 66. They are all lovely songs. I’ve always found Rascal Flats Life is a Highway especially engaging. If this song doesn’t make you want to tap your toes I don’t know what will! There’s also a lovely numbers by Brad Paisley, James Taylor, Chuck Berry, Sheryl Crow, John Mayer and more. I love the soundtrack! As far as weaknesses there are problems. As I’ve already said there’s the ridiculous world-building and the predictable rather saccharin story. Also I must admit this watch-through I was surprised how long it is. At nearly 2 hours I did find it wearing out its welcome. I was bored for stretches where we get long segments with Doc, Lightning and Mater racing, repairing roads, talking and other scenes. There is one bizarre scene where Lightning and Mater go cow-tipping with tractor cows (such a strange movie!). This movie could easily have 30 minutes taken away and not suffer a bit. In fact, it would be greatly improved. But all that aside I do love the message of Americana and remembering our rich history of small towns, Main Street, and Route 66. There are towns in America that the Interstate has made us forget but they were special places and we should remember them. Even the most flourishing of small towns are full of empty abandoned storefronts. I say this as someone who lives firmly in suburbia it is a real loss. I loved all of that. It also looks beautiful with vistas of red rock and sunsets. I also liked the friendships built by Lightning, Mater, Sally, and others. It’s a nice message for kids and the ending is very sweet. Plus, I find Larry the Cable Guy funny so Mater is great comic relief. It’s a mixed bag for me Cars and I didn’t like it quite as much this watch-through as I have in the past. But in the end these movies were made to entertain little boys without as much concern for crossover appeal as other Pixar movies. And I have yet to meet a little boy that doesn’t love Cars. Nothing wrong with that. Yeah, I don’t hate or even dislike this film, but it’s definitely not Toy Story caliber. Yeah, I agree with a lot of what you said. It’s a fine movie, just not great. I think if this had been produced by another company, people wouldn’t be hard on it. But because Pixar is known for such stellar movies, this one just doesn’t quite live up to many of the others. I do like the soundtrack too – Rascal Flatts’ Life is a Highway is one of the songs on my running playlist. And I guess that is a good thing. It’s what has pushed Pixar to make great films like Inside Out. Still I think people can be a little over-the-top when it comes to criticizing the less good Pixar. In the world of animation they aren’t as bad as Nut Job or Free Birds or some other truly bad film. It was only after watching Cars 2 that I came to appreciate this. At least it was done in a subtle way and had a real story with some character growth. And after watching that film I came to appreciate the slow pace in this. It’s still a bit derivative, though, and I don’t think I’ll be watching it again any time soon. You are so right that Lightning and Mater are a simpleton’s version of Woody and Buzz and this is simpleton Pixar, too. B is about right. I must admit I was a little bored this time. It is far too long. I actually think in a way Cars 2 was a little more exciting and unpredictable (I dont hate that movie like everyone else but you’ll see when I review it). What do you think of that message of remembering Main Street USA? I really like that part of the movie and it’s a very important lesson for kids. It definitely has those problems you mentioned and the premise is nutty but like you said “B- is about right”. I thought it added something to the movie. They weren’t very subtle about spelling out the message in that scene with Sally, but maybe that’s necessary due to the audience this is aimed at? It seemed to go with the territory basically. My aunt really liked this movie, though, and thought it was underrated (perhaps for the remembering-Route 66 message). Yeah I wouldn’t say it’s subtle. I think it is the audience it is aimed towards. And little boys love Cars. I have never seen one that didnt so I hope they get a little of that message. Once again, awesome review! Yeah, I wouldn’t say I disliked this film, but Indefijitely wouldn’t put it up there with films like Toy Story, Finding Nemo, Up, you name it for the most part. I’m curious to hear your thoughts on the sequel. But I guess we’ll get to that later, eh? I give this one maybe a C+. Anyway, great job again. Really, you liked the second one better, eh? Well, I’ll be curious to hear why later. No not better but I do think it is a little more unexpected and creative. This one has way more heart and is better animated. Pingback: Pixar Review 29: Cars 2 | Reviewing All 54 Disney Animated Films And More! Pingback: Did the Right Film Win? 2006 Animated Oscars | Reviewing All 54 Disney Animated Films And More! I love this movie. Partly because I’m a huge nascar fan and Richard Petty fan and he provides the voice for his own character with his famous #43 superbird as well as Lynda Petty (RIP) providing the voice for mrs the king. Also Humpy Wheeler a real life nascar track owner is the voice for Dinoco owner tex. I also love nascar history and cars of a bygone era and this movie pays homage to alot of those. i love Doc Hudson alot! The Hudson Hornet was one of the most dominate cars in nascar back in the 50’s and they even pay homage to the old nascar days with the “Fabulous hudson hornet” paint scheme that was actually used. Sure theirs alot of holes in the plot line but its a super cute move that teaches about the demise of rural america and america’s love affair of cars and racing. Great review, Rachel! 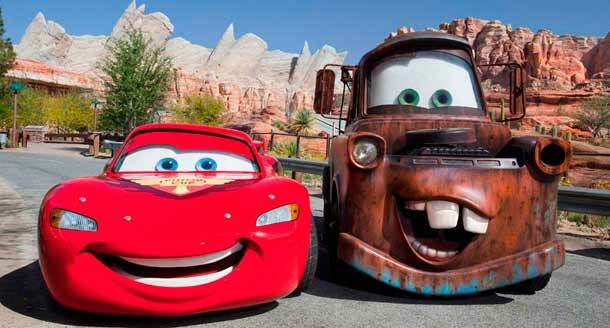 I like the friendship between Lightning McQueen and Mater. For me, Mater is a tolerable side character but I don’t think he can carry an entire movie. Thanks! Did you get enough Mater in this or too little? I got enough Mater in both this movie and the 3rd movie.